Quick Notes 75x75 Yellow Pack of 12 Quick Notes. Repositionable notes in bright Yellow ideal for messages and quick notes. Suitable for use in the home or office and will stick to most surfaces. Each pad contains 100 sheets, each pack contains 12 pads. 75x75mm (3x3ins). 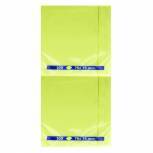 Q-Connect Quick Notes 76 x 76mm Yellow (Pack of 12) KF10502 Pack of 12 Q-Connect Quick Notes. 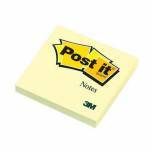 Repositionable notes in bright Yellow ideal for messages and quick notes. Suitable for use in the home or office and will stick to most surfaces. Each pad contains 100 sheets. Each pack contains 12 pads. 76x76mm. 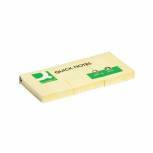 Q-Connect Quick Notes 38 x 51mm Yellow (Pack of 12) KF10500 Pack of 12 Q-Connect Quick Notes. Repositionable notes in bright Yellow ideal for messages and quick notes. Suitable for use in the home or office and will stick to most surfaces. Each pad contains 100 sheets. Pack contains 12 pads. 38x51mm. Q-Connect Quick Notes 76 x 76mm Neon (Pack of 12) KF10508 Pack of 12 Q-Connect Quick Notes. Repositionable notes in assorted Neon Rainbow colours ideal for messages and quick notes. Suitable for use in the home or office and will stick to most surfaces. Each pad contains 80 sheets. 76x76mm. 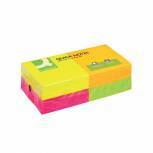 Q-Connect Quick Note Cube 76 x 76mm Neon KF01348 Pack of 1 Q-Connect Quick Notes. 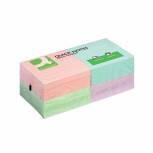 Repositionable notes in 320 sheet cubes ideal for use in the office or home and will stick to most surfaces. Size 76mmx76mm. Colour - Assorted Neon Colours. 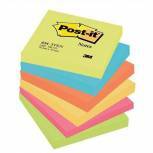 Post-it Notes Super Sticky 76 x 76mm Cape Town (Pack of 5) 654-SN Pack of 1 Holds stronger and longer. Super Sticky adhesive removes cleanly. Perfect for hard to stick surfaces. In neon rainbow. 90 sheets per pad 76x76mm. 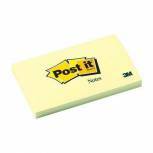 Q-Connect Quick Notes 76 x 102mm Yellow (Pack of 12) KF01410 Pack of 12 Q-Connect Quick Notes. Repositionable notes in bright Yellow ideal for messages and quick notes. Each pad contains 100 sheets. 76x102mm. Q-Connect Quick Notes Recycled 76 x 76mm Yellow (Pack of 12) KF05609 Pack of 12 Q-Connect Recycled Quick Notes. Repositionable notes manufactured from 100 percent recycled material. 120 sheets per pad. Size - 75 x 75mm. Colour - Yellow. 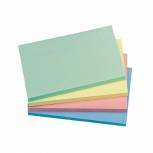 Q-Connect Quick Notes 76 x 76mm Pastel (Pack of 12) KF10509 Pack of 12 Q-Connect Quick Notes. 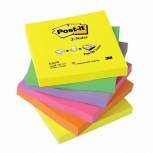 Repositionable notes in assorted Rainbow colours ideal for messages and quick notes. Suitable for use in the home or office and will stick to most surfaces. Each pad contains 100 sheets. 76x76mm. 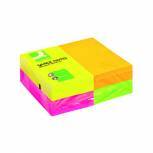 Q-Connect Recycled Quick Notes 76 x 127mm Yellow (Pack of 12) KF05610 Pack of 12 Q-Connect Recycled Quick Notes. Repositionable notes manufactured from 100 percent recycled material. 120 sheets per pad. Size - 75 x 125mm. Colour - Yellow. Q-Connect Fanfold Notes 75 x 75mm Yellow (Pack of 12) KF02161 Pack of 12 Q-Connect Fan Fold Quick Notes. 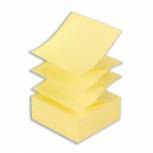 Pads of continuous sticky notes for use in Q-Connect Z-Note Dispensers. Size - 75x75mm. Colour - Yellow. 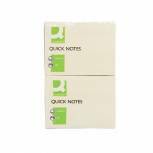 Q-Connect Quick Notes 76 x 127mm Pastel (Pack of 12) KF01349 Pack of 12 Q-Connect Quick Notes. Repositionable notes ideal for messages and quick notes. Suitable for use in the home or office and will stick to most surfaces. Each pad contains 100 sheets. 76x127mm. Rainbow Pack. 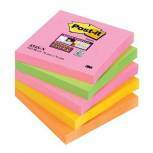 Post-it Notes 76 x 76mm Energy Colours (Pack of 6) 654TF Pack of 1 3M Post-it Notes Energetic Colours. Invaluable sticky notes for messages and notes. 100 sheets per pad. Energy Colours. 76mmx76mm. PEFC certified. Q-Connect Quick Notes 76 x 127mm Neon (Pack of 12) KF01350 Pack of 12 Q-Connect Quick Notes. Repositionable notes ideal for messages and quick notes. Suitable for use in the home or office and will stick to most surfaces. Each pad contains 80 sheets. 76x127mm. Assorted Neon Colours. 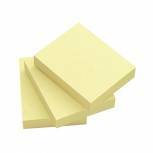 Q-Connect Quick Notes 51 x 76mm Yellow (Pack of 12) KF10501 Pack of 12 Q-Connect Quick Notes. Repositionable notes in bright Yellow ideal for messages and quick notes. Suitable for use in the home or office and will stick to most surfaces. Each pad contains 100 sheets. Pack contains 12 pads. 51x76mm. 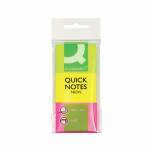 Q-Connect Quick Notes 38 x 51mm Neon (Pack of 3) KF01224 Pack of 3 Q-Connect Quick Notes. Neon Rainbow repositionable notes ideal for use on the desk or in your diary. Each pad has 50 sheets of brightly coloured notes per pad. 38x51mm. 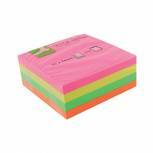 Post-it Z-Notes 76x76mm Neon Rainbow (Pack of 6) R330NR Pack of 1 3M Pop-up Z notes are fan folded so pop up one after another. For easy one handed dispensing when used with one of our pop-up note dispensers. Includes 6 neon pads. 76mm x 76mm. 100 sheets per pad.